It seems like no matter what the obstacle that stands before it, the stock markets, in particular in the U.S. markets keep grinding higher. After Apple crossed the $1 trillion mark on August 2nd, Amazon joined the trillion dollar club on September 4th. Amazon has been on an incredible run higher in the last two years, going from $800/share to $2050/share. However, while an investor may or may not directly own Amazon stock, if you have any investments in mutual funds that own large U.S. stocks, chances are better than average that you too are holding Amazon, albeit indirectly. We are now coming up on ten years since the Great Financial Crisis nearly ripped the global financial system apart at the seams. For everyone that tells you how close we came to collapse, I can vouch for that. After the fall of Lehman Brothers (ten years ago today), I had the privilege of having a front-row seat in the epicenter of the crisis, the short-term funding markets. Had it not been for the extraordinary policy measures taken by U.S. Treasury Department on Friday, September 19, the short-term funding markets wouldn’t have been able to open the following Monday. 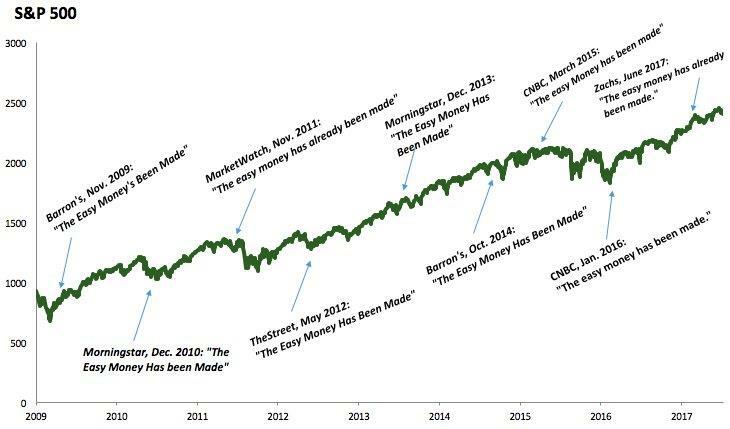 Since the crisis ended with a bang in early 2009, there has been no shortage of mavens, gurus, and market experts that have proclaimed that “the easy money has already been made,” implying that the likelihood of gains in the future is slim to none. The chart below highlights just some of those declarations. So has the easy money been made? There is no such thing as easy money when you are investing in the stock market. There may be periods of time where it seems pretty easy, but those periods of time have frequent episodes within in that can test the resolve and patience of any investor. Having an allocation in the market, and being able to manage your positions, especially in our information-driven age unemotionally is a challenge in and of itself. Something interesting that I came across this week, was that if you had the misfortune of buying the S&P 500 the Friday before Lehman Brothers went bankrupt you would have lost 46% over the next six months or so, but on the other hand, if you bought that day but never sold you’re up around 185% in total. Easy money indeed! But you didn’t get one without the other. What makes this roller coaster ride more bearable is for an investor to have a predefined plan that helps maximize the probability of attaining long-term financial freedom. Looking for opportunities to sell “in favor” assets in order to buy “out of favor” assets is just one of the ways that investors can take advantage of strength and weakness in the market, and can add value through both portfolio diversification and behaviorally as investors remove emotion from their investment decision-making process. So don’t worry about earning easy money, there is no such thing.